Representatives of royal dynasties and monarchy are surrounded by magnificent art objects, expensive fabrics and tapestries, exquisite decorations and, of course, golden dishware, one of the key attributes of royal life. Although, every person can fill the shoes of aristocrats by buying golden cutlery or gilded glasses. 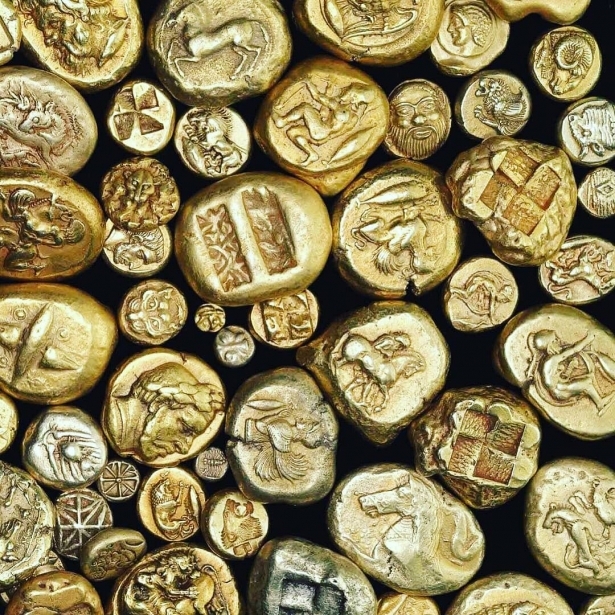 At all times, gold has been valued by mankind. Noble metal symbolizes wealth and greatness, indicates the level of well-being and the owner’s high status. Due to its high malleability ductility, gold has been used for the manufacture of utensils and cutlery since the ancient times. The rulers of Ancient Egypt and Ancient Rome, noble Scythians, Indian leaders and priests of pre-Columbian America ate from precious plates. An interesting fact: if the enemy was invited to join the dinner, during which the food was served on golden plates, it meant the offer of peace. 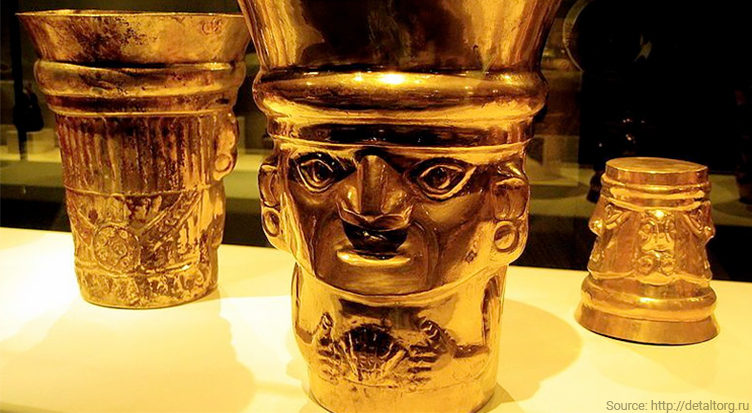 In the photo: dishes of the ancient Incas made of gold (XIII century). In the X-XV centuries, dinner tables for wealthy gentlemen were most often served with sophisticated golden dinnerware set of round and oval shapes, all handmade and decorated with precious stones and carvings. No ceremony was held without a golden dishware. The best and the most expensive stuff always had to be on display. In this way, the rich and noble people demonstrated their belonging to the higher class. In ancient Russia, a royal feast was unimaginable without precious dishware. Golden cups, ladles and bowls were widespread among the Russian nobles in the XVII century. Usually the items were decorated with pearls and gems. 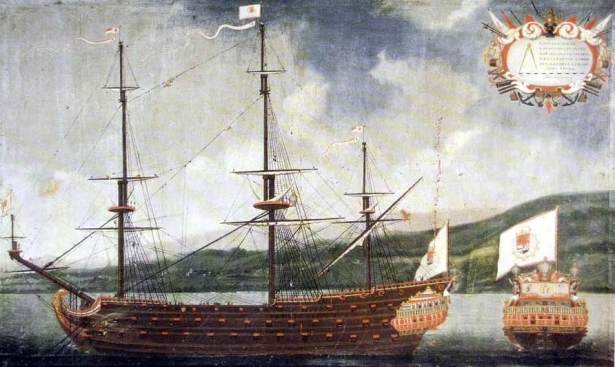 Golden buckets and scoops were made in the form of a rook - a vessel that resembled a floating bird. Foreign gold wines of top quality were served in gold cups, and fresh honey was stored in gold scoops. In the photo: golden dishware of the rulers of Ancient Russia, 1680s. 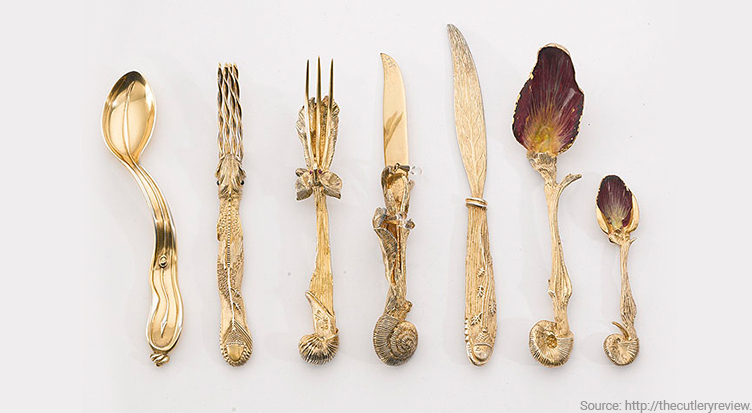 Gold cutlery for European royal houses was made mainly by jewelers from Hamburg. Knives, forks and spoons made of gold, richly decorated with intricate ornaments and embossments. Since the yellow metal deformed easily, only a knife’s handle was made of it, while the blade was made of steel. In the photo: antique golden tableware, France, XVIII century. Golden tableware is, above all, a work of art, not just functional household items. A tradition of presenting golden dishware and tableware sets as a gift came in style several centuries ago. 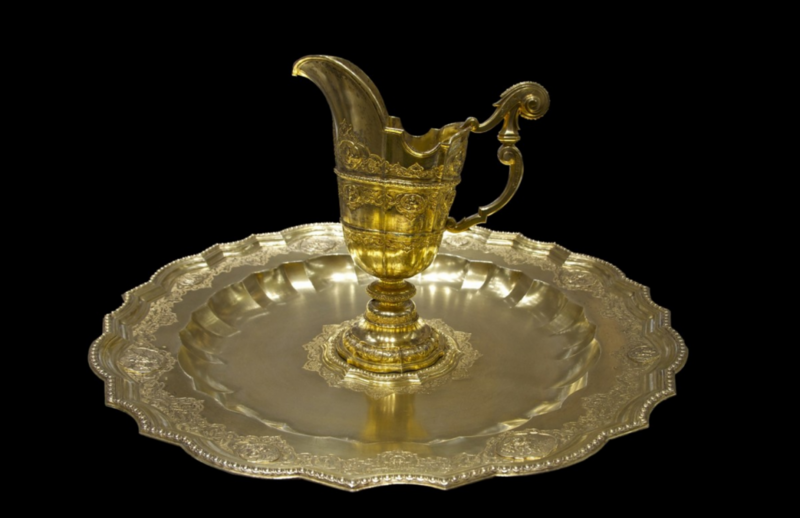 Aristocrats and noblemen gave each other sets of exquisite dishes made of gold. The event, on the occasion of which the gift was made, has been usually depicted on the decor of gold items: the jeweler made a commemorative engraving, applying the initials of the person whose anniversary/jubilee was celebrated and a family crest. 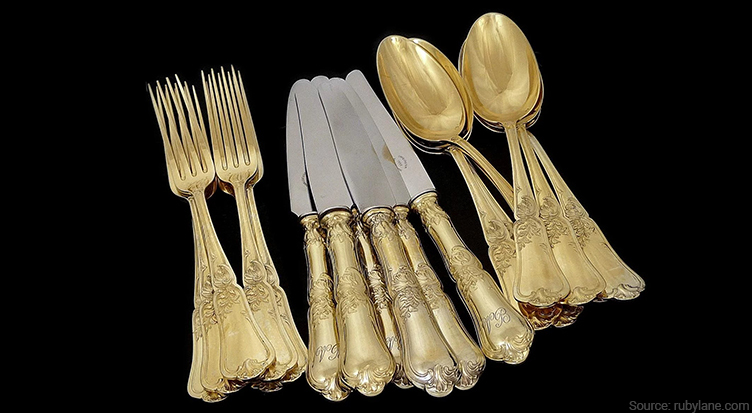 Golden dishware sets were inherited and were considered a family heirloom. Their value increased over time. Nowadays, many jewelers, designers and high fashion houses create real masterpieces of gold - exclusive tableware worth a lot of money. In the photo: in 1957, the genius of modernity, the artist and sculpture Salvador Dali created a unique set of Menagere tableware, stylized as objects of wildlife. 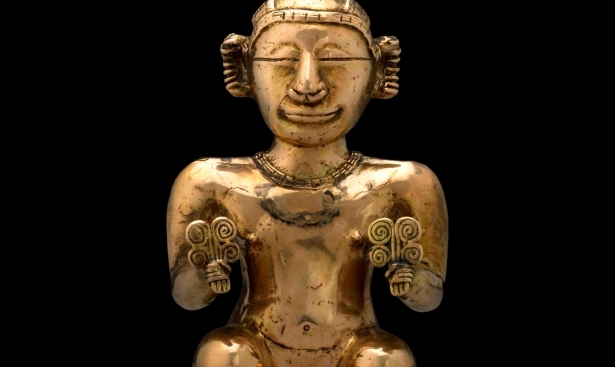 The set was made of silver and coated with gold. In 2014, the set was sold at Sotheby's for $28,125. In the photo: an exquisite Versace dinnerware coffee set consists of a sugar bowl, a creamer, a round tray, six cups and saucers. The dishes are made of gold leaf and decorated with embossed floral patterns. 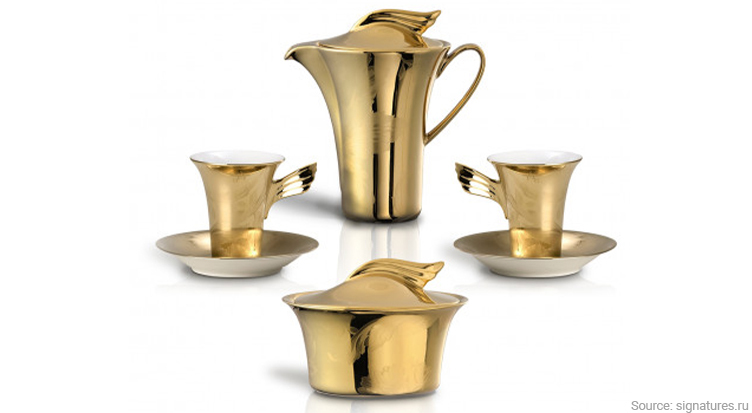 The price of this gold tableware amounts to $1270 dollars. In our time, gold is a reasonable investment. A wealthy person who buys golden dishware and tableware most often do not use it for its intended purpose but puts it on display as an interior object, an indicator of luxury and material well-being. People who want to accumulate their capital, invest in the purchase of gold bars that serve as a reliable asset to protect savings from inflation. Gold is the guarantor of personal Financial Security.